The website you’re reading right now has been a labor of love for about a year now. And yesterday, I passed a major milestone by publishing my 100th blog post. I launched this website last May as a single home for all of my work online. It’s been a hugely valuable organizational tool for me when searching my archives for story research or job hunting. But I wish this blog, as well as my Facebook and Twitter accounts, could be more of a conversation with you, my friends, family and strangers who read my articles. I use the word “serve” purposefully when I describe what I do. I want to provide the news you need and want to hear. And I know you’re reading this blog (almost 3,000 views on this blog since I bought the domain just shy of a year ago). So here’s my question to you: What do you want to see on this blog? On Twitter? On Facebook? What’s going to keep you engaged with what I do day-t0-day? I want your honest opinion. I’m always looking to improve. Comment here, send me a tweet, or contact me privately. I’m looking forward to hearing from you. 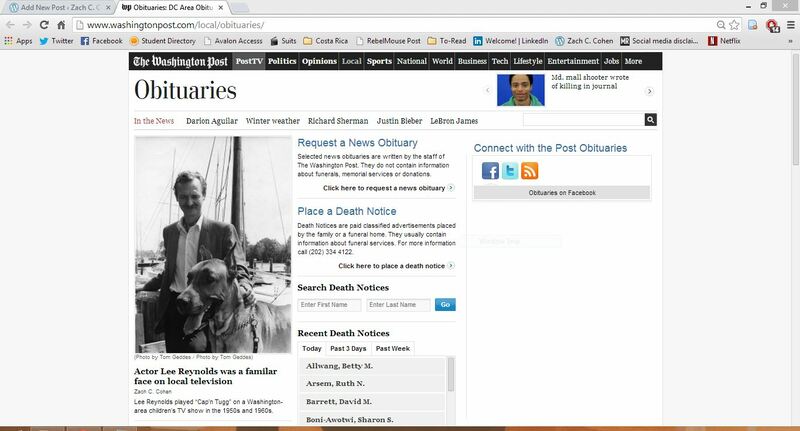 My first Washington Post story leading the Obituaries front. Lee Reynolds, an actor who played the seafaring title role on “Cap’n Tugg,” a Washington-area children’s TV show in the 1950s and 1960s, and who later became an announcer, writer and director for the public broadcasting station WETA, died Jan. 27 at Capital Caring hospice in Arlington. He was 87. The cause was lung cancer, said his wife, Christine Lewis Reynolds. Read the rest of my obituary of children’s show actor Lee Reynolds and my first byline for The Washington Post. 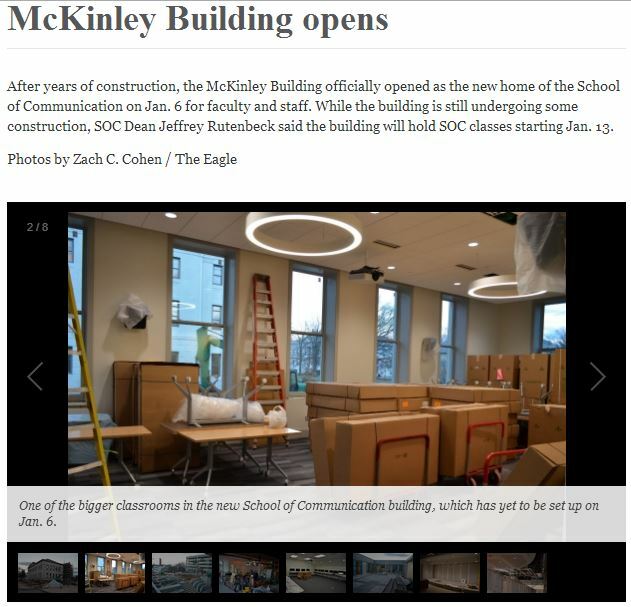 UPDATE Jan. 30, 9:43 a.m.
B5 with a skybox on B1: My first print byline for The Washington Post, and my first byline in the print edition of a national newspaper. It was hard being Jewish. 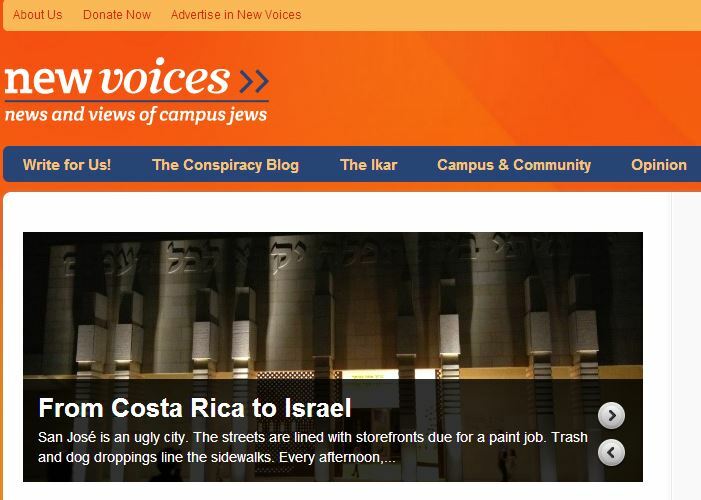 There were no Shabbat dinners or daily prayers in my life, so I felt Jewish a grand total of three times in Costa Rica. I had to seek out spiritual enlightenment, and that usually only happened within the walls of the synagogue. That stood in stark contrast to Israel, where being Jewish was pervasive and, by extension, easy. Everything around our hotel on the Kinerret closed on Shabbat, forcing time for reflection and relaxation. Kosher food is bountiful. Hebrew is omnipresent. 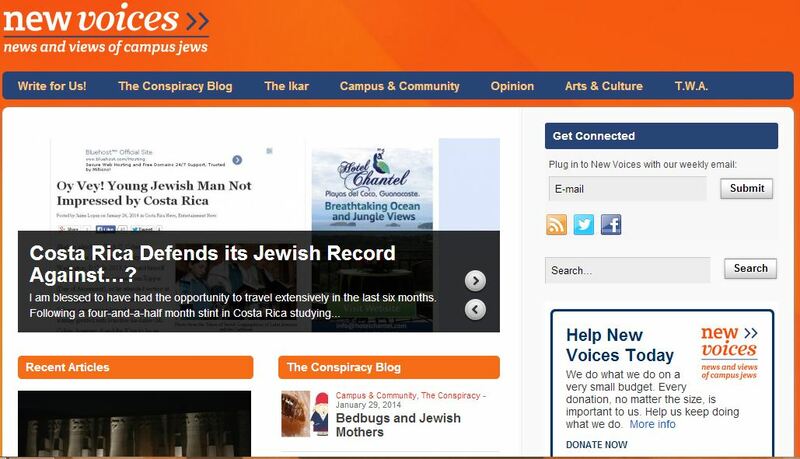 But I felt just as Jewish at services at B’nei Israel as I did when I was surrounded by it in Israel. 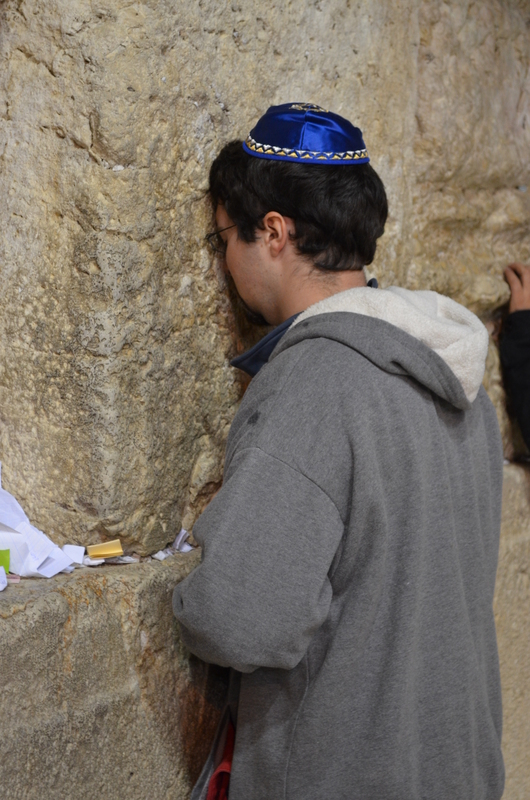 10 hours in a shul in Latin America was as spiritually fulfilling as 10 days in the Holy Land. Read the rest of my reflection on my travels at New Voices. In non-journalism news, I’m joining the cast of William Shakespeare’s “Julius Caesar” at American University this spring. I’ll be playing the triple role of Flavius/Trebonis/Messala. As a part time student/journalist next semester, I had extra time to do a little theatre with my favorite playwright (I wrote a 30-page paper in high school analyzing the psychology of Shakespeare’s tragic protagonists). This will also be a fascinating look at Shakespeare’s classic tragedy in a mostly gender-reversed cast. Instead of Roman politicians, Brutus, Cassius and Caesar are all high school girls. Picture “Julius Caesar” meets “Mean Girls.” Odd at first glance, but it makes a lot of sense the more you think about it. Kudos to director Megan Fraedrich for drawing that connection and allowing me to be a part of the process. The group of students producing this show, the Rude Mechanicals, have been my friends since freshman year. It’s a privilege to finally share a stage with them. The show goes up Feb. 27 to March 1. Picked up a girlfriend in Chicago, and we still get along almost a year later. Finished my tenure as editor-in-chief of The Eagle, one of the best weekly student newspapers in the country. 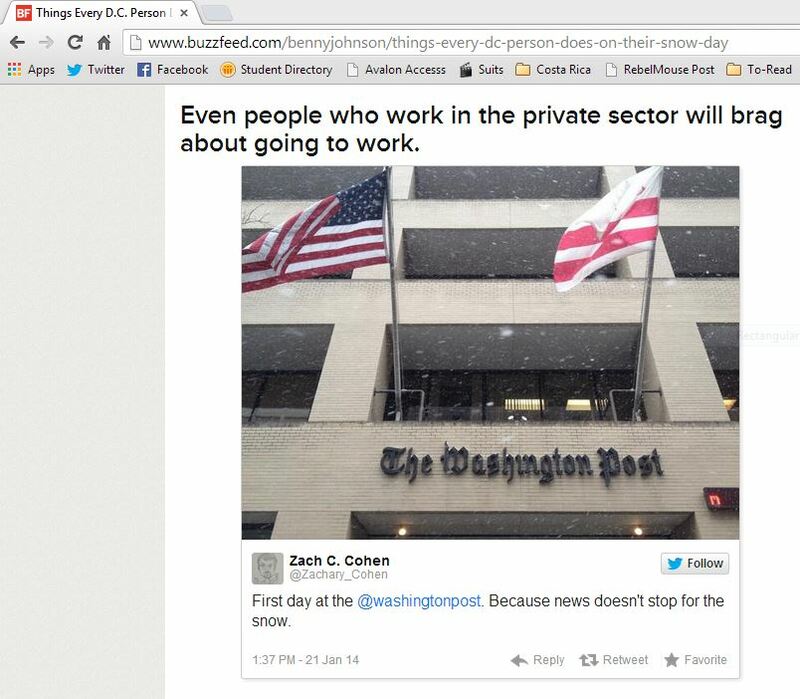 Interned for a phenomenal five months at PBS MediaShift. Lived for four and a half months in Costa Rica, the most verdant country I have ever had the pleasure to call home. Traveled in Israel, which I have always called home. Secured my last internship of my academic career at The Washington Post, a newspaper I have revered since moving to DC three and a half years ago. Through good times and bad, I could count on friends and family to be there for me. I’ve made some enemies, I’ve made more friends. I’ve had some sucesses, I’ve made more mistakes. I cried, but I more often I laughed. There have been good days and bad. I don’t regret a second. Come at me, 2014. I’m ready for you.